An Award recognising the use of the Irish Language in business. A big thank you to all who bought tickets for the School Raffle. We raised over €400 which will be used for the Garden Project! Rachaidh cóip don phríomh nuacht na scoile díreach ar an leathnach Facebook gach lá. - Tá cead ag teastáil sular gcuireann tú suas aon fhógraíocht. - Níl cead aon rud diúltach a chur suas ar an leathnach. - Níl aon teagbháil faoin fóirne, daltaí nó tuismitheoirí ceadtha air. - Ní ceart grianghraffanna na bpáistí a ‘tag’ ionas gur féidir iad a aithint. Má bhriseann tú ceann de na coinníollacha seo beidh do chead isteach san suíomh tógtha uait go deo. The school's Facebook Page is now available at: https://www.facebook.com/GaelscoilChionntSaile as an alternative channel for sharing the same news that goes out via “Nuacht”. All information from the schools primary news source "Nuacht" will automatically copy onto the school Facebook page each day. As per Facebook policy Children under the age of 13 are not allowed to use Facebook. While we do not police this, please keep this in mind. - Advertising of any sort must be cleared with the school before posting up. - You must not post anything on the page of a negative nature. - No discussions about staff, pupils or other parents is permitted. - If photos of children are uploaded to the Facebook site then they should not be tagged as to identify them. If any of the conditions above are broken your access to the site will be permanently removed. To start receiving Nuacht via Facebook simply "like" the school's Facebook page. Tá bosca éadaí caillte againn san oifig. Beidh siad ag dul go dtí an siopa dara láimhe tráthnóna amárach (Dé hAoine 29ú Meitheamh 2012) mura bpiocann sibh suas iad. We have a box of lost clothing. It will be going to the second hand shop tomorrow afternoon (Friday 29th June 2012) if the clothes are not claimed. Beidh cruinniú sa scoil maidin amárach (29 Meith 2012) do thuismitheoirí Rang 2 ag 08.30. Pléfear an t-athrú atá ag teacht ar chomhdhéanamh na ranganna an bhliain seo chugainn. Tá an cinneadh déanta anois go malartófaí na grúpaí chun seans a thabhairt don dá ghrúpa eispéireas deifriúl a bheith acu do roinnt le rang níos sinne agus rang níos óige. Tá sé tábhachtach go bhfreastalódh na tuismitheoirí ranga uile ar seo más féidir. There is going to be a meeting for the parents of the 2nd class children in the school tomorrow morning (29th June 2012) at 08.30. We will be discussing the very recent decision to change the composition of the mixed classes. It has been decided to swap the class groups around so as to give each child in the current 2nd class an opportunity to experience sharing with a younger class and also an older class. It is important to attend this meeting if at all possible. Looking to do something different this summer with the family, hire a boat from Kinsale Boat Hire, safe, stead & easy to drive. Go fishing or exploring, no experience needed as full training given and make sure you ask for the special midweek discount for the Gaelscoil. 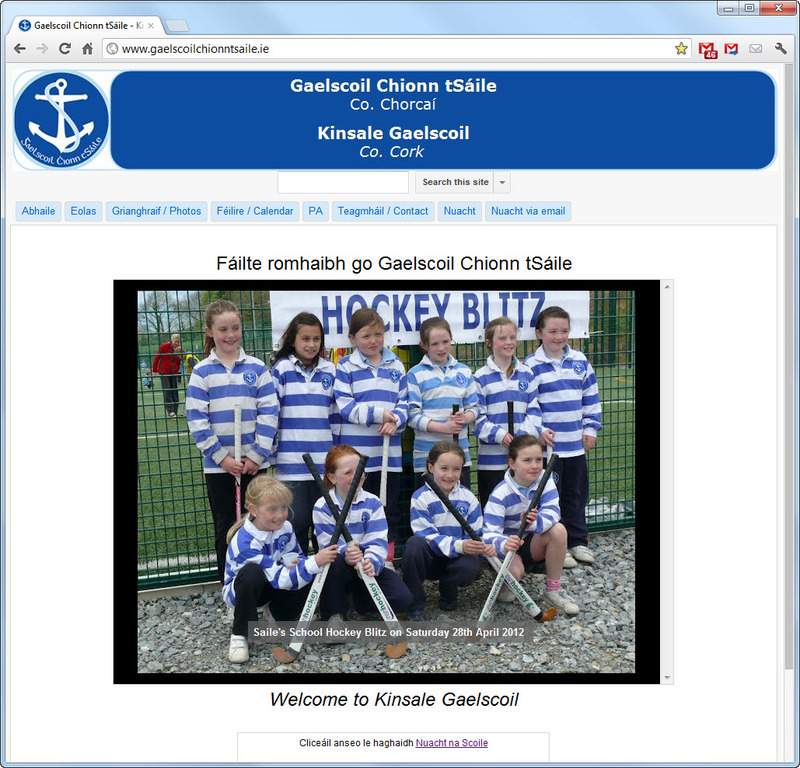 For details go to http://www.kinsaleboathire.ie or call 087 1 747585. Kinsale Tennis Club is running two summer camps (16th July 2012 and 30th July 2012) for ages 5+. Our coaches will mix in fun, exercise and expert tennis coaching regardless of tennis abilities. Non members also welcome. See attached poster for further details. Please find attached information on Kinsale Rugby Club's Kidscamp running from 20th August 2012 for one week. Boys and girls aged 6-12 years are all welcome. The cost for the week is just €65 per child. Please contact Kim on 0877973868 for more information or simply post/email this form to kimkerins@gmail.com to book your child's place. Tá eolas faoin campa peile Chionn tSáile agus foirm clárú le fáil in oifig na scoile. There is information and registration forms for the Kinsale Football Camp available in the school office. Raffle Tickets - Last Chance!! Last remaining Raffle Tickets to be dropped into the Box in Hilda's office – for anyone who has lost tickets please put name and money in Envelope and we will put new tickets in the draw for you. Beidh Blitz Iománaíochta ar siúl sa scoil amárach, an Déardaoin, 28.06.'12. le haghaidh Rang 1,2&3 (ag braith ar an aimsir!). Tóg do chamán agus do chlogad má tá siad agat, chomh le bútaisí agus stocaí gearra. There will be a hurling blitz tomorrow, Thursday, 28.06. '12, in the school for 1st, 2nd and 3rd classes (weather permitting!). Please bring in your hurley and helmet if you have one, as well as boots and spare socks. 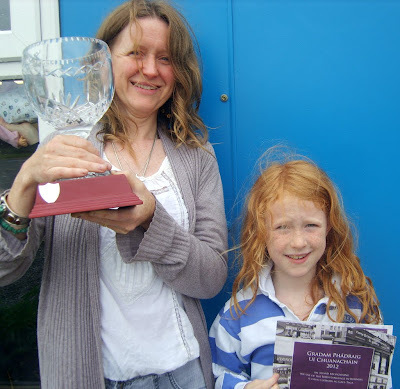 Comhghairdeas Fin who was a first prize winner for Gymnastics at St. Multose Hall on Friday 22nd June 2012. Can those who are interested in using the service please contact pa@gaelscoilchionntsaile.ie. Please note that the service is offered at a fee and at a first come first serve basis (as numbers are limited). We are eager to get this started in September therefore, can those wishing to avail of the service please forward your childs name and contact details as soon as possible. 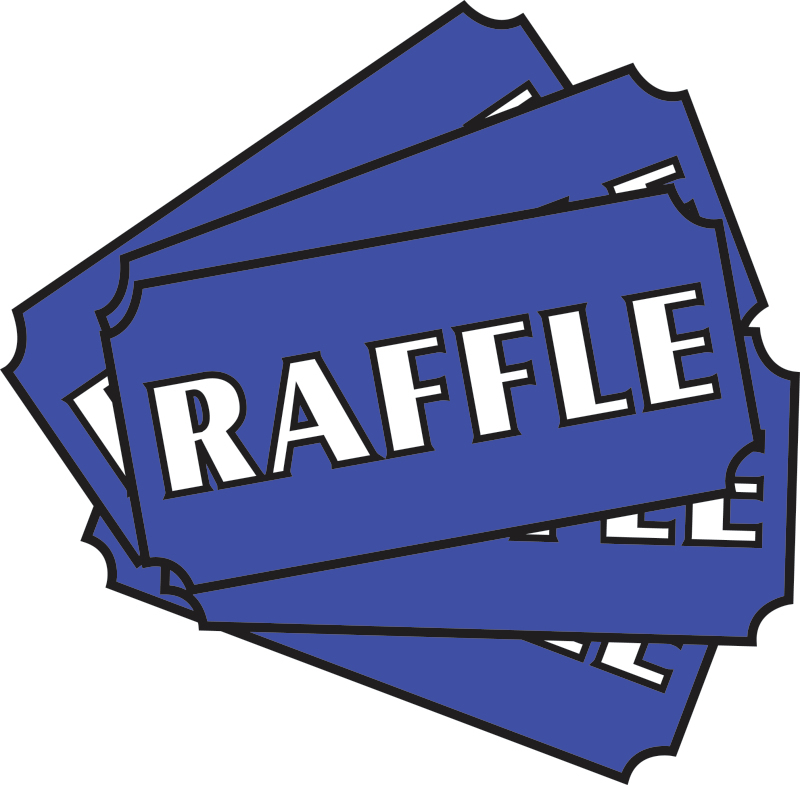 Many of you have returned the raffle tickets (thank you) can all others please try and get your tickets in by next Wednesday 27th June 2012. We are going to do the draw on the Friday the 29th. June 2012. There are lots of prizes to be won!!!!!!!!!!!!!!!!!!!!!!!!! Comhghairdeas Connor agus Ailís who both were first prize winners for Gymnastics at St. Multose Hall on Friday 22nd June 2012. Tá Blitz Peil ag Rang 1 & 2 ar an Luan seo chugainn, 25.06.'12. Tá ar na páistí a n-éadaí spóirt a chaitheamh. Is féidir leo búataisí peile agus péire stocaí sa bhreis a thógaint leo chomh maith. 1st and 2nd Class have a Football Blitz at the GAA pitch this Monday 25.06.'12. The children must wear their school sports clothes. They can also bring football boots and a spare pair of socks. Tá bríste fada in easnamh ón lá O.E.C. Is le Caoimhe Ní Loinsigh é agus tá a ainm air. An bhfuil sé ag éinne? There is a school track suit pants missing since the O.E.C. outing. It is belonging to Caoimhe Lynch and it has her name written on the label. Does anyone have it? Léine rugbaí caillte ag éinne? / Anyone lose a rugby shirt? Léine rugbaí caillte ar lá OEC. Tá sé san oifig. T-léine bán faoi chomh maith. Rugby shirt lost on the O.E.C day. It is in the office. White t-shirt underneath it also. An féidir libh na tuairiscí scoile a sheoladh ar ais chuig an scoil amárach. Bhí fadhb againn leis an meaisín fótachóipeála agus níor tháinig gach tuairisc amach i gceart. Gheobhaidh siad ar ais arís iad tráthnóna amárach. Could you please sent the school reports into school tomorrow. We had a problem with the photocopier and the reports were not copied correctly. The reports will be sent home again tomorrow afternoon. Uniform stock left in the school - for sale @ €5 a piece. D'fhág leanbh bróga uisce san OEC. Tá siad san oifig. A child left a pair of water shoes in the OEC. They're in the office. Beidh roinnt laethanta breise á cur leis seo Meán Fómhair seo chugainn. There will be a few more dates to add to this next September. An bhfuil léine rugbaí Óisín Mac Aodha ag éinne? Tá sé in easnamh ón OEC inné. Tá a h-ainm air. Does anyone have Óisín Hayes' rugby shirt? It is missing since yesterday. His name is on it. Beidh Rang 1,2& 3 ag dul go dtí an Club Rugbaí ar an Aoine, 22ú Meitheamh '12, le haghaidh Blitz. Beidh bus á thógaint ann agus á thógaint thar nais go dtí an scoil iad. Mar sin tá gach rud mar an gcéanna le gnáth lá ar scoil ach amháin bí cinnte go gcaitheann siad an Éide scoile. Beidh siad ag tógaint a lóin leo go dtí an blitz. 1st, 2nd and 3rd Class will be going to the Rugby Club for a blitz this Friday, 22nd June '12. There will be a bus bringing them there and back. Therefor, everything is the same as for a normal day at school but be sure that they wear their Sports Clothes. They will be taking their lunch to the blitz. Crios(O Ceilleachain Rang 1 - M Ciara), brought home an extra Rugby Top with him today from the OEC Centre after school tour! So if you have a check to see if you are missing a Rugby Top. Unfortunately, Crios put it in his bag with all his own wet, sandy clothes - so I'll give it a wash and Crios will bring it to school with him on Thursday and whoever owns it can collect it from Muinteoir Ciara. Tá irisleabhar spóirt nua, Rebel-Óg, le cheannach do R2 & R3, costas €3. Ní gá é a cheannach, áfach. Beidh na páistí in ann iad a fheiscint agus déarfaidh siad libh má tá siad ag teastáil uatha. There is a new sports magazine, Rebel-óg, that 2nd and 3rd class can buy for €3 at school. It is not necessary to buy it, however. The children will be able to look at it and they will tell you if they want it. Greetings to all the Schools as you break for the Summer Holidays from the Child of Haiti Office. As you break for the Summer Holidays, I would like to wish all the Teachers, Staff and students ‘Happy Holidays’. May I also take this opportunity to thank all the schools that have participated in the Child of Haiti Programme and ‘Sponsoring a Child’s’ Education. We greatly welcome your support. Your help will enable us to continue our good work with an already vulnerable population. For the schools that would like to participate in our Programme, I would appreciate if you could give ‘Child of Haiti’ which is a new young charity (based in Limerick) your consideration and would welcome your support in Sponsoring a Child’s Education next September (€130) for 1 Year. You might consider discussing this with the school’s Board of Management for consideration in September 2012. (It is a very interesting project for young students and schools to become involved in). I am in the process of getting the schools that have already sponsored children in communication with the schools in Haiti and also forwarding on the Haitian child’s academic progress and school attendance results to the schools. The feedback has been very positive to date. The teachers and children seem to enjoy participating in our ‘Children’s Educational Sponsorship Programme’. Best wishes to all of you, I will check in with you in September. Beidh an scoil á éagrú HB Fun Day ar an Aoine seo. Beidh an t-airgead ag dul ar aghaidh go Down Syndrome Ireland. Beidh uachtar reoite ar fáil do na leanaí go léir agus mar sin beidh €2 ag teastáil ó gach páiste. Chomh maith le sin beidh Coiste na dTuismitheoirí ag déanamh pancóga ar an lá sin. Beidh na páncóga saor in aisce. The school is organising the HB Fun Day on this coming Firday 22nd June 2012. All the money collected will be going to Down Syndrome Ireland. Each child will receive an ice-cream and the cost of this will be €2. In addition, the Parents Association will be making pancakes on the day for the children. These will be free of charge. Beidh Rang 1,2&3 ag dul go dtí an O.E.C. 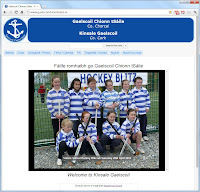 (Outdoor Education Centre), Cionn tSáile ar an Mháirt seo chugainn 19 Meitheamh 2012. Tóg do pháiste díreach go dtí an OEC ar a 9 a chlog ar maidin agus bailigh ann iad ar 3.30pm le bhúr dtola. Costas: €22, le híoc roimh laethannta saoire an tsamhraidh le bhur dtola. 1st 2nd and 3rd Classare going to the O.E.C. 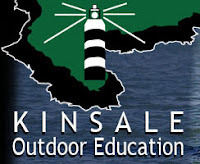 (Outdoor Education Centre), Kinsale Tuesday 19th June 2012. Please bring your child directly to the OEC at 9 o'clock that morning and collect them there at 3.30pm. Cost: €22 to be paid before the Summer holidays, please. Hi! There is a Voice coach/Piano teacher from the United States in town for the summer and is looking to give lessons if possible to children in the Kinsale area. He is currently working on his doctoral degree in Music at the University of Oklahoma. He has quite a lot of piano performing experience (mostly collaborative) in both classical and popular styles, as well as much experience in church music. VocalIy, he have been involved as a principal in some two dozen operatic productions, and a handful of musicals; He has also served as coach and musical director for several musical theater productions. He has been teaching piano (and later, voice) for the last ten years, and feels comfortable with most any age and most styles of music. Tá dhá chartán bainne sna málaí scoile uile inniu i gcóir na laethannta nach raibh siad ar scoil le déanaí (Lá an turas scoile agus an lá saor inné). Cuir iad sa cuisneoir um thráthnóna, b'fhéidir. There are two cartons of milk in each of the school bags today for the days that they weren't at school recently (The school tour day and the day off school yesterday). Maybe put them in the frig this evening. 1st 2nd and 3rd Classare going to the O.E.C. (Outdoor Education Centre), Kinsale next Tuesday 19th June 2012. Ag braith ar an aimsir (!) beidh na Naíonáin Bheaga ag siúl le haghaidh Barnardós ar an Déardaoin an 21ú Meitheamh 2012 ón scoil síos go dtí an chrosaire. Tá na cártaí urraíochta í mhála scoile do linbh inniu. Depending on the weather (!) the Junior Infants will be walking for Barnardos next Thursday the 21st June 2012 from the school to the cross. The sponsorship cards are in the children's schoolbags today. Dear Parents : Raffle tickets have gone home with the children today – we only sent home one lot per house hold (If in error you received more than this please just discard). Anyone who wishes to purchase more please contact us at pa@gaelscoilchionntsaile.ie Please fill in your name on one half of the ticket and return in envelope provided with €5. To a box that is located inside the office (marked Raffle tickets) Please try and return before Wednesday the 27th June 2012 and the draw will take place on Friday the 29th 2012 before end of school. Best of Luck to everyone – the prizes are galore and you have a good chance of going home with something!!! All Proceeds go to the Gaelscoil directly. Family Fun Day Volunteers Please! !